Here in the United States, Mother's Day is in just two weeks, and what could be more appropriate than stitching up a mama for this occasion? I decided that I needed to create two kinds of mama and baby animal pairs, and today I get to share them with you! Above you see the Loving Alpacas. 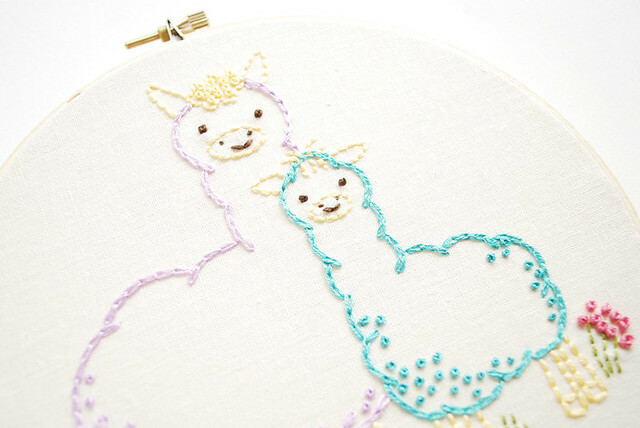 They were almost llamas, but alpacas are much sweeter, which makes them right for Mother's Day, right? They are a mini pattern in my shop, which makes the pattern only $2. And the next mama and baby is a free pattern for you! I'm pretty sure that moms aren't too keen on having slothful kids, but this mama is okay with it. This pair makes me smile and squeal a little every time I look at it. Eep! I just want to hug them! Download the Sloth Mama's Day PDF pattern. This pattern is sized to fit in a 4-inch hoop, with the branch going right to the edges of the hoop. If you were the kind of kid who had to be asked dozens of times to do your chores, I'm sure your mom will see the humor in this one. I love the alpacas. Did you know that when a vet is asked to help deliver a baby alpaca they refer to it as 'unpacking and alpaca'? How sweet is that! Sorry unpacking an alpaca not and alpaca. Whoops! That's the cutest thing ever...unpacking an alpaca...I'll remember that! Best PDF ever, Mollie! Sloths are my all time favorite animals...I just recently did an embroidery of one, too! Those are hysterical. What mom wouldn't love that. We love handmade gifts from our kids. These are fantastic ideas! I loooove the aplacas - one of my fave animals ever, and sloths are too cute! I LOVE this pattern! Thank you! I shared on Facebook! Oh my gosh Mollie!!! oh my gosh oh my gosh oh my gosh!! Can you hear me squealing all the way over there?? I LOVE SLOTHS!! You just totally made my day. I'm.so.happy!! hehe Thank you so, so much for creating and sharing this!!!! So cute! Your French knots are amazing. Somehow I don't seem to get the hold of that. I really, really love sloths a lot, ever since I can think (do you say that in English...??...)! The alpacas are wonderful, too! I was terrible about cleaning my room. I used to just clear a path from the door to the bed and from the bed to the window so I could escape in case of a fire and call that good enough, lol. Anyway, cute sloths! Mollie you are so creative and super adorable. I love this pattern. I am printing it out as we speak and am highly contemplating stitching it on the bottom of my socks. So cute! Looks like my quest for a cute llama picture is still on, but I might have to get the world's sweetest alpacas anyhow. Super sweet - the stitchings and you for the lovely free pattern! thank you! These patterns are adorable! I'm not a sloth fan - I mean that they are OK but they have never excited me - but this... You are so right when you say you could just hug them. Thank you for the pattern! I have LOVED sloths ever since I first laid eyes on them, watching a show on TV (Animal planet I think) LOVE THEM!! All these years later, I've never seen them done in any form (craftwise). These are so cute. SO CUTE... I have to make one immediately. Thanks so much for sharing your adorable design. You have made one old lady so very happy and I hope more people will see just how sweet, gentle and amazingly cute sloths are. You are the BEST! !